We decided to try to do some more climbing and hiking in Yosemite over Labor Day weekend. The idea sounds ridiculous – going to one of the most popular parks in America on one of the busiest weekends, without any kind of reservation. But, we’ve done it before and it always seems to work out, as long as we are willing to be flexible with our plans. 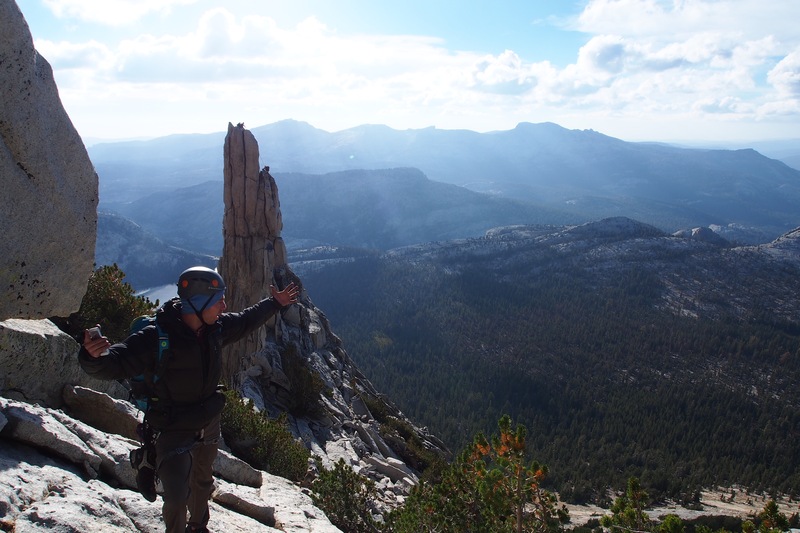 We were hoping to climb Cathedral Peak, an easy, popular 5.6 climb in Tuolumne. Aside from that, we were open to backpacking, hiking, and car camping, so we grabbed all the gear and we figured we’d just do whatever we could. We arrived on Friday and they still had sites available at the Sweetwater campground, which is located 15-20 minutes west of the park entrance. It’s not pretty and it’s right by the highway, but it works, especially if you’re just looking for a place to crash. They often have sites still available, even on busy weekends, since it’s first-come, first-serve. 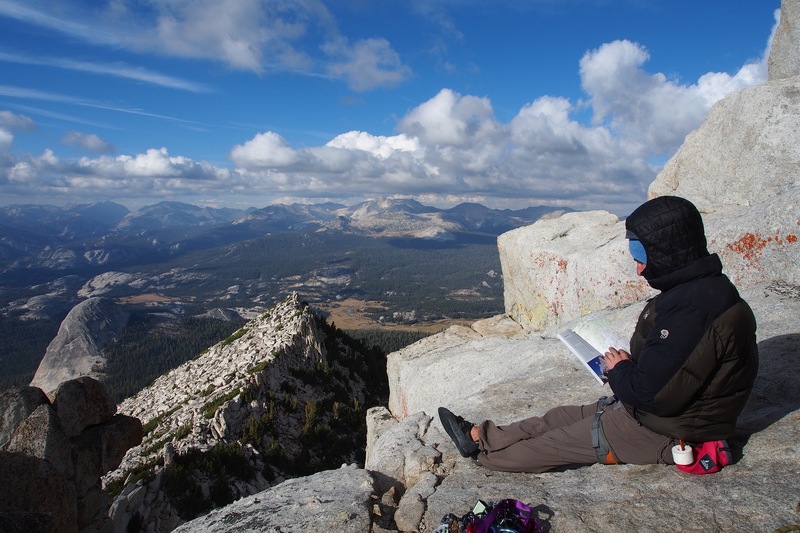 We got up early on Saturday and headed to the Wilderness Permit building in Tuolumne Meadows. We thought we’d try to get a day-of backcountry permit so that we could hike, climb, and camp in the backcountry somewhere, given that getting a car-camping spot in the park was unlikely. However, it didn’t work in our favor this time. We showed up around 7 (it opens at 8) and there were already quite a few groups in line who snagged any remaining permits before us. It probably could have worked if we’d been willing to get there earlier. We decided to go climb Cathedral and just play the rest of the day by ear. We knew we could camp on a forest service road outside the park if need be. The approach to Cathedral is ~1.5-2 miles, not too tough. The climb was incredibly fun, although crowded as anticipated. We ended up doing a lot of waiting around at belay stations, even though there are a lot of variations that can be done on the route. This is because the upper pitch and summit can only be done safely by a few people at a time. On the bright side, the waiting time did allow us to meet some friendly fellow climbers who invited us to join them at their campsite in Tuolumne Meadows! Another good tip is to go left or right of the famous chimney section – we did a 5.7 variation on the left side. This seemed like the best call since it allowed us to pass a couple groups who were waiting to do the chimney, and it wasn’t too technically demanding. We did the climb in 5 pitches, enjoyed some amazing views from the summit, and descended. The descent was a little trickier than anticipated, many people prefer to stay roped up for the first section of the descent, which we didn’t realize. We recommend starting pretty early if attempting this climb on the weekend – otherwise prepare to climb in the dark and bring headlamps. We finished with plenty of daylight but a lot of groups behind us had to finish in the dark. A lot of novice climbers use this climb as one of their first multi-pitch routes, which means a lot of people were struggling and moving slow. Be warned! We had hoped to do a quick climb up Eichorn’s Pinnacle after the Cathedral summit, but unfortunately we ran out of time. Back to the campground we went! We considered doing another climb on Sunday but were feeling pretty stiff, so hiking seemed like a better option. We’ve always wanted to hike to North Dome since it is known for having spectacular views of Half Dome and the Valley, so that’s what we did. It totally lived up to the hype! It was ~8 miles round trip from the trail head off 120 and very worthwhile. After the hike, we headed back to the bay to enjoy Labor Day at home. All in all, a successful holiday weekend in Yosemite! It can be done!